Norman Mark Reedus (Norman Reedus) is an American actor and model who was born on January 6, 1969 in Hollywood, Florida, USA. He is best known for his roles as Daryl Dixon in AMC TV series The Walking Dead. He is also famous for his role as Murphy MacManus in The Boondock Saints (1999) and its sequel The Boondock Saints II: All Saints Day (2009). He is 5' 10" (1.78 m) and is from Italian, English, Scottish, and Irish descent. He later moved to Los Angeles, California and then lived in Japan, Spain, and the United Kingdom for some time. He worked as a painter, photographer, sculptor, and as a video artist while in California and also at the Harley Davidson shop in Venice, California. His first acting gig was in a play called Maps for Drowners on Sunset Boulevard at the Tiffany Theater. Norman's first acting gig in a movie was in Mimic (1997) which was directed by Guillermo del Toro and he played Jeremy. He then went on to acting in other movies, 8mm, Hero Wanted, Six Ways to Sunday, Blade II, American Gangster, and Moscow Chill. Norman is best known today for his role as Daryl Dixon in the AMC series The Walking Dead which started in 2010. Norman auditioned for the part of Merle Nixon but did not get it. The Walking Dead comic creator Robert Kirkman liked Norman's audition so much that he created a specific character for him to play in the TV series that is not in the comic book series of the same name. Robert Kirkman is happy with his decisions and feels that Norman had made a great impact in The Walking Dead series. His character is unique and the writers have lots of fun making up his role and writing what he has to do in the episodes. 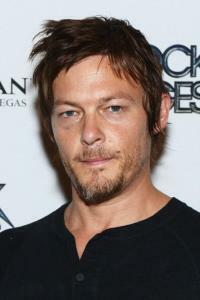 Norman was nominated in 2012 for his part as Daryl Dixon for a Saturn Award for Best Supporting Actor. Norman was in a long-term relationship with supermodel Helena Christensen. They dated from 1998 to 2003 and have a son, Mingus Lucien Reedus who was born October 13, 1999 in Denmark. Norman and Helena are friends and share joint custody of their son Mingus. Norman was involved in a major car accident in 2005 in Berlin. He now has a titanium eye socket and four screws in his nose as a result of the accident. Norman has a New York-based film production company named Bigbaldhead and currently lives in New York with his son, Mingus Lucien Reedus. Norman has many tattoo’s including his father's name on the left side of his chest, his son's name on his right forearm, two demons on his back, a devil on his upper right arm, a star on his right hand, a heart on his right wrist, and a snake on his left leg. Some of the modeling companies he has modeled for include Levi’s, Prada, Durban, Alessandro Dell'Acqua, Lexus, and Morgenthal Fredrics. Judas by Lady Gaga (as Judas). Some of his artwork is on display in New York, Berlin, and Frankfurt.